Summary: "The Near Witch is only an old story told to frighten children. " My Thoughts: I wish I could find a witch story that I truly love, one that I fall in love with and want to keep reading hours out of the day. The Near Witch took me about four days to read, which is a long time for me to read a book. It's not that it wasn't interesting, it was but it was just not my kind of story... again... I just can't seem to find witchy books that I enjoy. It's ironic because I love the tv shows The Secret Circle and Witches of Eastwick. I wish I could find books that relate to witches where I could get sucked in and not be able to stop reading until I finish the book. We are introduced to Lexi who lives with her mother and sister Wren. Her uncle Otto lives right next door so he's around a lot. Her dad has been gone a while now, and Lexi still misses him dearly. A new boy named Cole comes to town and he's a mysterious new stranger so nobody trusts him. It doesn't help that children start to disappear at the same time he arrives. As tensions get higher with the all children missing, the town starts to get suspicious and needs to find out where these children are going. The easiest solution is to blame the new guy Cole. 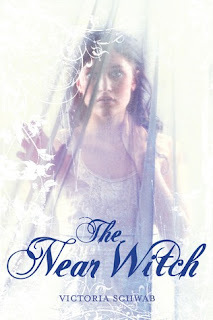 Lexi believes that The Near Witch is the culprit and she is getting her revenge on the town of Near. The Near Witch is a centuries old story that still makes its way around town and only few know the real story. While Lexi and Cole are dealing with their own battle on the missing children, the town is also looking for them in all the wrong places. What happens to the children? What happens to Cole and Lexi? What about the other two witches who live in Near? Read this book now to get answers! I hope someday to find a witch story that I truly deeply adore. Overall: I didn't go too into detail about this one because if you like witch stories, you’ll probably like it and I don’t want to ruin it. I liked Lexie but I felt like she and Cole fall for each other too fast. She was just infatuated with him because he was the new person in town. I didn't understand that. The Near Witch was a beautiful story, it was told in such a unique perspective, I'll be the first to say it had a certain beauty to it. It just wasn't the right book or story for me. I really do need to find a witch story that I love love love! The Near Witch was just an okay read for me. I liked it, I finished it, but it won’t make my favorites of the year. Cover: Love it! It's so plain without a lot of color but still real pretty. I had a hard time reading this novel. It wasn't for me either. I could see the greatness there, but couldn't feel it...I don't know. This didn't resonate with me. This is a novel I've been trying to read for ages but there's been so many different reviews on it. I didn't really like this book either-it just made me feel so sad and it wasn't unique enough to really stand out in my mind. This was also a slow read for me. Witch stories are so hard because most readers will compare them to Harry Potter. I just don't think anything will ever measure up to that series so we are constantly let down. I'm sorry this one didn't completely do it for you! The cover is pretty and it sounds so promising, that I'm willing to give it a try. Thanks for the review! It will be fun to compare our opinions once I read this book.